Chrome Canary. Google Chrome Canary has the newest of the new Chrome features. Be forewarned: it's designed for developers and early adopters, and can sometimes break down completely. So the reason you would use one of these is because or their debugging tools; meaning you have the ability to peer into the web page in a super efficient way to either see how it is working or why its broken. For this course you will be developing in Google Chrome. We will not be addressing supporting non evergreen browsers. There are entire courses out there strictly teaching people how to use the chrome dev tools. Opend the dev tools by right clicking on a web page and selecting Inspect. We will only really be using two of these resources: Elements, Console, and maybe Device Mode. That's it for now, but don't worry you will get a lot of time with this. A text editor is not the same as a word processor. A word processor allows you to independently apply styles to text like italics, bold, underline, size, and font. Word processors were designed to create content to be read by people. It like looking at a website. You see the result of the formatting to make content easier to read. A text editor is specific for writing code. It can apply formatting based on file extension; you cannot just randomly make a word large or big or red. You can write upper and lower case letters, numbers, and symbols. The default font is always set to a monospaced font (each character is the same width). This really helps visually align your code. A text editor is not the same as and IDE (integrated development environment). An IDE is more of a toolbox while a text editor is more of a tool. IDE can really help with testing and compiling code but that comes at a price. A lot of times you will have to buy an IDE and they have the potential to use a lot of your system resources and they can run on the slower side. Some languages require an IDE. These languages are monolithic and rarely have the coolest tech available. A text editor is usually a pretty fast application. When I said its more of a tool than a tool box you have to know that its a super tool thanks to the extensibility of the tool. You can install all sorts of plugins that will give your editor more power. Editors are very personal, and each persons editor of choice is always the best. If you have one, I will not try to change your mind. But know that if you use the one I use (bc its the best) I will be able to help you write code in a very efficient way. Atom has a ton of configurations that can be installed. We are going to install a few that will help us get started. Atom allows its functionality to be extended the the installation of Packages. Packages can be used for many things, but our main use for them now is to aid in the writing of clean and syntactically correct code. We need to open our Atom Settings again (you just did that). We do a lot of things with files that normal users don't need to see. A lot of files on your computers are hidden to prevent people from breaking stuff. Its required that we see these files. It is also super important that we show file extensions too. When most people think of programming a picture of the terminal may pop in ther head. It has the potential to be an intimidating tool but as a developer you will discover that you will not be able to live with you, and you will also realize it's not difficult to use at all. Open this directory in Finder open . Go to the immediate parent directory cd ..
Open this directory in Explorer explorer . Version control is a technological solution for being human. How many of you have ever deleted or changed something that you regret? We all have. Programmers don't just write code, we have this nasty habit of changing code. Unfortunately, no programmer is perfect, and sometimes, mistakes are made. Version control gives us the ability to go back to an older version of a file. It also allows us to see the changes that have occurred to a file over time. There are many version control systems out there. Often they are divided into two groups: centralized and distributed. 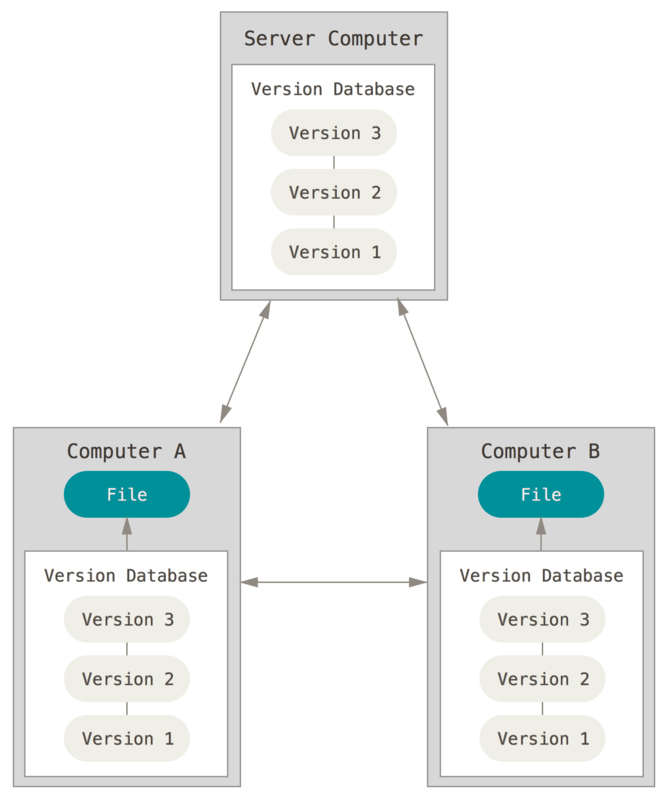 Centralized version control systems (CVCS) are based on the idea that there is a single central copy of your project somewhere (probably on a server), and programmers will commit their changes to this central copy. Examples: CVS, Subversion, and Perforce. Distributed systems (DVCS) do not necessarily rely on a central server to store all the versions of a project's files. Instead, every developer a copy of a repository and has the full history of the project on their own hard drive. This copy (or clone) has all of the metadata of the original. Examples: Git, Mercurial, Bazaar or Darcs. Git is a distributed system. Conceptually, most other systems store information as a list of file-based changes. You think of the information they keep as a set of files and the changes made to each file over time. Instead, Git thinks of its data more like a set of snapshots of a miniature filesystem. Most of the interaction you have with git will be on your own local computer. Git can operate completely independently of a network connection; it doesn’t need to go out to the server to get the history and display it for you. This is accomplished by having a local git repository/database. You work with it and when you are ready, you can sync up with a git repository on the internet. 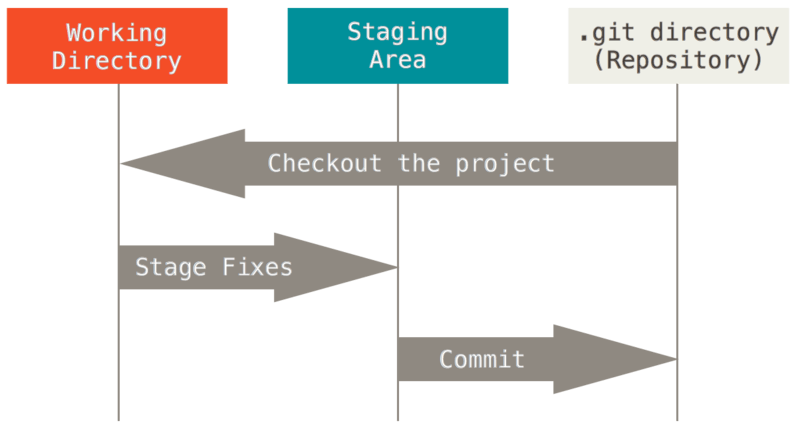 There are 3 states of a file in git: committed, modified, and staged. Committed: The data is safely stored in your local repo/database. Modified: You have changed the file but have not committed it to your database yet. Staged: You have marked a modified file in its current version to go into your next commit. GitHub is a code hosting platform for git that promotes collaboration. It lets you and others work together on projects from anywhere. You can create projects for just about anything. I use GitHub to hold the code my projects, to let me contribute to the code on other projects, to keep track of my computers configuration files, and to even plan events. You will use GH to keep track of every piece of code you write in this class. By the end of this session you will have put a ton of content into your own personal repository. Github uses a concept of issues. The purpose of issues is basically calling out something thats broken or needs to be done. Issues are not a part of git; they are purely a GH feature. Ok so hopefully you read or already knew the topics presented in the part 1 post of this series. We basically went over a super basic setup of folder structure for the seed project we will be creating. For this post we will be picking up where we left off in part one; use this repo to align yourself. We are going to be installing Webpack and setting up a build process. Our build process will eventually transpile our ES6 code, processing images, applying styles, and including a an additional library. Right now it is just going to bundle some stuff together and use an html template to create static source code. Webpack is a module bundler that will create static assets. Basically we can create our project how ever we want then use Webpack to build a static site. This makes it easy to deploy but can be hard to debug. Hopefully you will see a version printed out. If not you may not have node installed. Follow these instructions for installation. Ok so let's get this started. First we are going to install Webpack and we are going to use a flag telling it to save this as a project development dependency. It is a development dependency because it is not needed to run the application, but it is to work on it. You will also have to install webpack globally in order to use the command line tools. This creates an entry in package.json. Open that file and take a look. You will notice webpack listed as a key on an object. The value is the version of webpack we are using. It is using a caret range meaning it will allow changes that do not modify the left-most non-zero digit. Ideally this 3 part identification follows this pattern [major, minor, patch]. In a perfect world, this would be safe but it does assume the author of the package will only release breaking changes in a major version. That is rarely true so I advise against using caret ranges and using exact version installs. The easiest way to resolve this is to manually delete the caret from the package.json file. It also copied the webpack code locally to this project and put it in the node_modules directory. Every installation we do with npm will by default place content in this directory. You may remember in the previous post we created a file to ignore content from our git repo. Our node modules are folders we do not want versioned. They already are so no need for us to do it too. Next we need to create our configuration file that will instruct webpack what to do. Open this file in your editor and add the following code. Ok, time to run webpack. We use the webpack command line interface (CLI) and give it a configuration file. By default webpack will look for webpack.config.js so technically we do not have to pass the file name of our configuration. I have never really liked defaults and prefer to be explicit; it's easier to understand for the next guy. For this next part we need another package installed, html-webpack-plugin. This plugin simplifies the creation of html files to serve our webpack bundles. So webpack has a concept of plugins. This allows us to use existing functionality or even write new stuff into our build processes. We need to create a new file to serve as our template file. Now go back to webpack.config.js so we can use this plugin in our process. Add a new property to our configuration called plugins. Plugins is an array. Create a new instance of our plugin and pass in a configuration for it. Real quick I'll explain the configuration we are using for this plugin. Title: Sets a property that we use in our template for the title tag. Filename: The name of our file once it is created. This file will be placed in the output path that we created earlier. Template: The template we are using to create the html file. Inject: Determines where we place the script tag for bundle.js. Hash: This gives us the option of adding a random query string to prevent the browser from using cached versions of a file. There are way more configuration options available. Read about them. Now let's run the code linter. What we are going to do is run the standard code rules on all .js and .jsx files in the project, then take the output of that and run it through the the standard-reporter for better formatting and readability. This should pass and basically nothing will happen. You can test a failure by adding a semicolon after the path declaration on line 1 of webpack.config.js. Save the file and then run our last terminal command. You should see an error now. Go ahead and revert that change, save, and run again. Project is now listing and your code will be cleaner. Many IDEs have really useful plugins for StandardJS too. I am going to add three scripts. The first one is called test and it will run our standard code listing task. The next one is called build-dist and it will delete the dist directory then run webpack to create a clean distribution folder. The last one is a compound task that basically runs tasks. It will run the test script and if it passes it will run the dist script. If test fails it will error out the report in the terminal. "dist": "npm test && npm run build-dist"
Awesome! We covered a lot here but this just the tip of the iceberg with Webpack and ReactJS. Stay tuned; the next one will really put some pixels on the page.